On June 28, 2018, the Italian Post Office issued a commemorative stamp of Angelo Secchi SJ to celebrate the bicentenary of his birth. 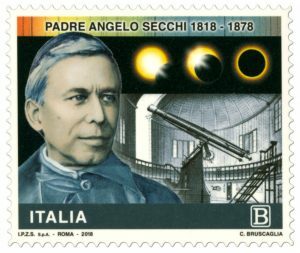 The stamp, realized by the designer Cristina Bruscaglia, depicts a portrait of Father Angelo Secchi and, in the background, a reproduction of an old print showing the inside of the dome at the Collegio Romano where the Astrophysical Observatory hosting the Merz refractor telescope was located. At the top, the stamp shows a representation of a solar eclipse and of a stellar spectrum.